"After all the Serbs have done to us, I will never talk to one of them, nor will I be able to live close to one. And if they have killed my son, I will seek revenge on one of them... I went back to look for my son and my brother, but heard Ragib screaming while they were slaughtering him. I was just listening to his voice. I couldn't help him." EDITOR'S NOTE - Eight men who survived what may be Europe's worst massacre since World War II - the slaughter of thousands of Muslims after Bosnian Serbs overran Srebrenica in July - recently made it to safety after 140 days in hiding. TUZLA, Bosnia-Herzegovina -- When Omer Johic wants to tell his brother something, he whispers in his ear. He doesn't have to anymore, but whispering became a habit after 140 days of life on the run in enemy territory. Four and a half months ago, 40,000 Muslims were driven from the enclave of Srebrenica, in eastern Bosnia, when it was overrun by Bosnian Serbs. Thousands of men fled on foot. Many of those who were caught were killed. The Johic brothers were among the many who ran and the few who survived. 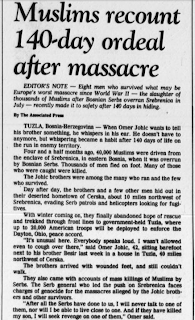 Day after day, the brothers and a few other men hid out in their deserted hometown of Cerska, about 10 miles northwest of Srebrenica, evading Serb patrols and helicopters looking for fugitives. With winter coming on, they finally abandoned hope of rescue and trekked through front lines to government-held Tuzla, where up to 20,000 American troops will be deployed to enforce the Dayton, Ohio, peace accord. "It's unusual here. Everybody speaks loud. I wasn't allowed even to cough over there," said Omer Johic, 42, sitting barefoot next to his brother Besir last week in a house in Tuzla, 40 miles northwest of Cerska. The brothers arrived with wounded feet, and still couldn't walk. They also came with accounts of mass killings of Muslims by Serbs. The Serb general who led the push on Srebrenica faces charges of genocide for the massacres alleged by the Johic brothers and other survivors. "After all the Serbs have done to us, I will never talk to one of them, nor will I be able to live close to one. And if they have killed my son, I will seek revenge on one of them," Omer said. The Johic family, like many other Muslims in Srebrenica, had gathered in the city -- a U.N.-declared "safe area" for Bosnian Muslims -- after their town was overrun in 1993. The area was protected by a few hundred Dutch peacekeepers who had neither arms nor orders to hold back the Serb advance. Among the thousands who fled were Omer, his 16-year-old son Hazim and Omer's brothers. After two days of walking, Serb shells crashed into their column, and shooting began. "I had my son Hazim with me and my two brothers, Ragib and Besir," said Omer. "Ragib got wounded in his leg and was slow. But I also lost the hand of my son Hazim. I never found him again." "Many dead and wounded were left in the ravine. I went back to look for my son and my brother, but heard Ragib screaming while they were slaughtering him. I was just listening to his voice. I couldn't help him." Eventually, the Johic brothers found six other men from Cerska. They knew the terrain well, and hid out in a hamlet near their hometown. It was there, Omer said, that he witnessed events corroborated by other survivors. Bosnian Serb commander Gen. Ratko Mladic, who oversaw the capture of Srebrenica, has been accused of genocide and crimes against humanity for allegedly ordering the massacres that followed. 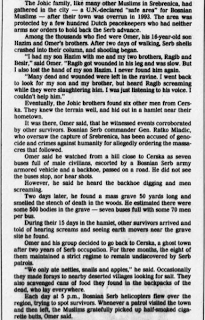 Omer said he watched from a hill close to Cerska as seven buses full of male civilians, escorted by a Bosnian Serb army armored vehicle and a backhoe, passed on a road. He did not see the buses stop, nor hear shots. However, he said he heard the backhoe digging and men screaming. Two days later, he found a mass grave 50 yards long and smelled the stench of death in the woods. He estimated there were some 500 bodies in the grave - seven buses full with some 70 men per bus. During their 15 days in the hamlet, other survivors arrived and told of hearing screams and seeing earth movers near the grave site he found. 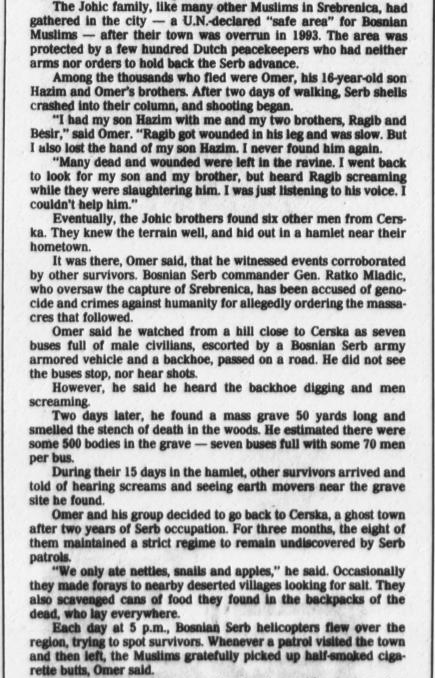 Omer and his group decided to go back to Cerska, a ghost town after two years of Serb occupation. For three months, the eight of them maintained a strict regime to remain undiscovered by Serb patrols. "We only ate nettles, snails and apples," he said. Occasionally they made forays to nearby deserted villages looking for salt. They also scavenged cans of food they found in the backpacks of the dead, who lay everywhere. 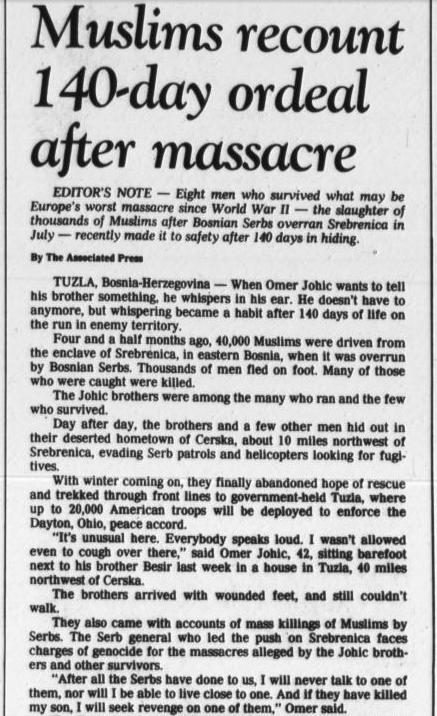 Each day at 5 p.m., Bosnian Serb helicopters flew over the region, trying to spot survivors. Whenever a patrol visited the town and then left, the Muslims gratefully picked up half-smoked cigarette butts, Omer said. Whispering, sneaking around and not coughing nor snoring became a way of life. 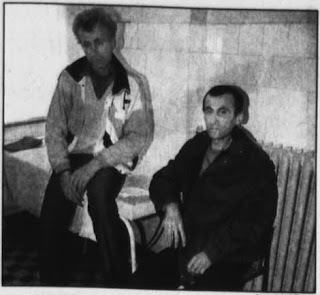 Omer and Besir made almost no sound as they moved through the house in Tuzla, where they found their families after years of wartime separation. "We never spoke unnecessarily and if we did, we whispered," Omer recalled. "We never walked around except in fog or covered in the dark of night... We never made a fire, except in the night sometimes." Often they lost hope and thought of giving up, but "we encouraged each other." Then, snows came. 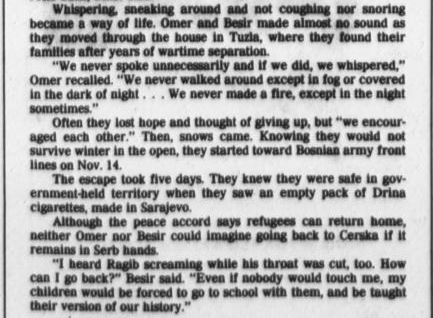 Knowing they would not survive winter in the open, they started toward Bosnian army front lines on Nov. 14. The escape took five days. They knew they were safe in government-held territory when they saw an empty pack of Drina cigarettes, made in Sarajevo. Although the peace accord says refugees can return home, neither Omer nor Besic could imagine going back to Cerska if it remains in Serb hands. "I heard Ragib screaming while his throat was cut, too. How can I go back?" Besir said. "Even if nobody would touch me, my children would be forced to go to school with them, and be taught their version of our history."